SCVHistory.com LW2858 | Film-Arts | Tex Williams Fan Club Invitation, 8-6-1948. 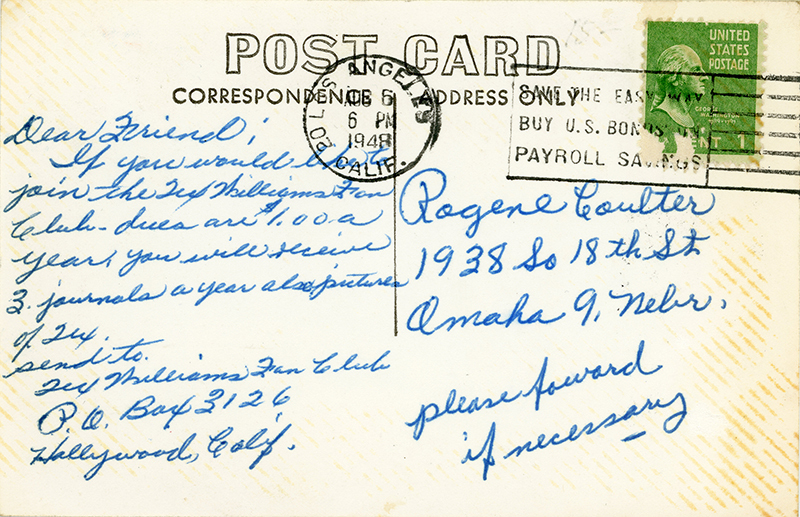 Penny-postcard invitation to join the Tex Williams Fan Club, sent from Los Angeles to a prospective member (Rogene Coulter) in Omaha, Neb., on Aug. 6, 1948. Handwritten invitation reads: "Dear Friend: If you would like to join the Tex Williams Fan Club — dues are $1.00 a year. You will receive 3 journals a year also pictures of Tex. Send to: Tex Williams Fan Club / P.O. Box 3126 / Hollywood, Calif. / Please forward if necessary." Born Aug. 23, 1917, in Ramsey, Ill., Sollie Paul "Tex" Williams was Spade Cooley's lead singer and guitarist in the 1940s when Western swing was at its zenith. Tex struck out on his own as "Tex Williams and His Western Caravan" and recorded his biggest hit, "Smoke! Smoke! Smoke! (That Cigarette)," in 1947. Written for him by Merle Travis, the song stayed at No. 1 on the Billboard charts for six weeks and became Capitol Records' first million-selling issue. Tex made his motion picture debut in 1943; Universal Studios (as Universal-International) put him under contract in 1948, just as the era of the "B" Western was drawing to a close. Tex starred in a couple of dozen short musical features (approx. 25-minute runtime) through 1950. 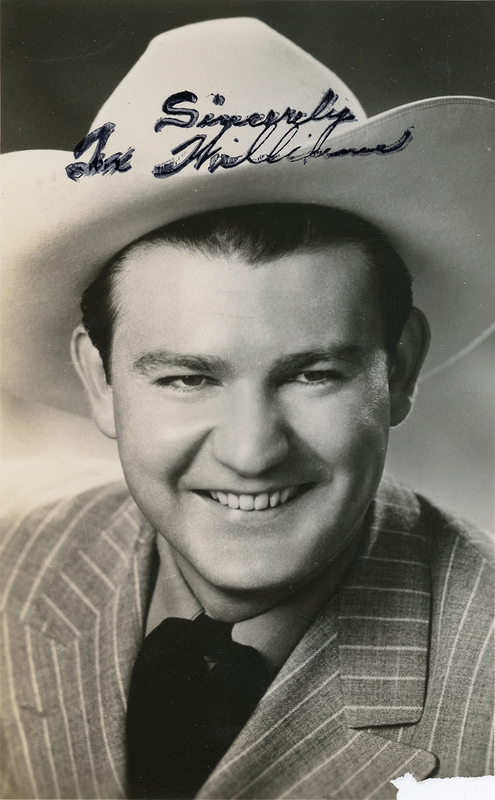 Tex Williams and His Western Caravan remained popular touring and radio stars in the 1950s. In the 1960s, Tex and wife Dallas (1916-2001) moved to the Happy Valley section of Newhall after their house in Bel Air burned down, and Tex bought the old French Village nightclub on San Fernando Road (later called Newhall Avenue). Inducted into the Downtown Newhall Walk of Western Stars in 1983, Mr. "Smoke! Smoke! Smoke!" had a running battle with cancer and ultimately succumbed to kidney failure at Newhall Community Hospital on Oct. 11, 1985. Both Tex and Dallas are buried in the Zane Grey Garden at Eternal Valley Cemetery in Newhall. Further reading: Recollecting My Neighbor, Tex Williams by Patti Rasmussen. LW2858: 9600 dpi jpegs from original postcard purchased 2017 by Leon Worden.